College journalists are notoriously poor interviewers. So for the past three years, SPJ has trained them to chat up their sources by quizzing corpses. 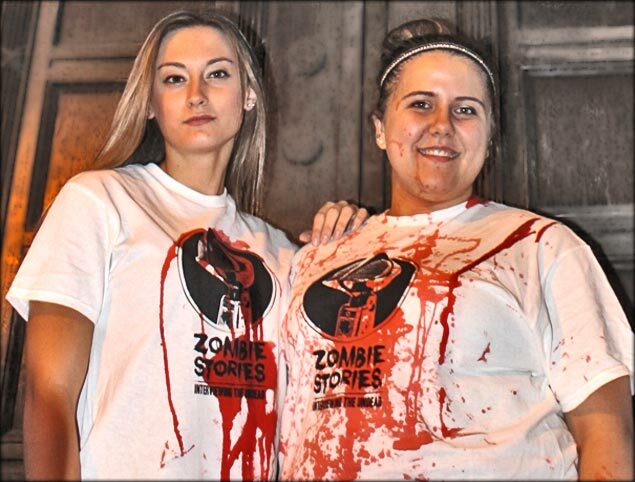 This free program is called Zombie Stories, and it can easily spread to your city. Students don free white Zombie Stories T-shirts and venture outside to interview professionally made-up zombies – each carrying a bottle of fake (?) blood. If students ask stupid questions, they get doused. Once their shirts are all red, they’re dead. But if they pose solid questions (see below) they win cash and prizes. On the Saturday night before Halloween, Zombie Stories visited Atlanta – on the exact spot where a key scene from the first episode of The Walking Dead was filmed. It’s an alleyway near a pub called, appropriately enough for journalists, Sidebar – where SPJ once hosted another participatory event called Putting the ME in Social Media. For this year’s CMA Fall National Media Convention, I embraced that darker side with more black and less life. 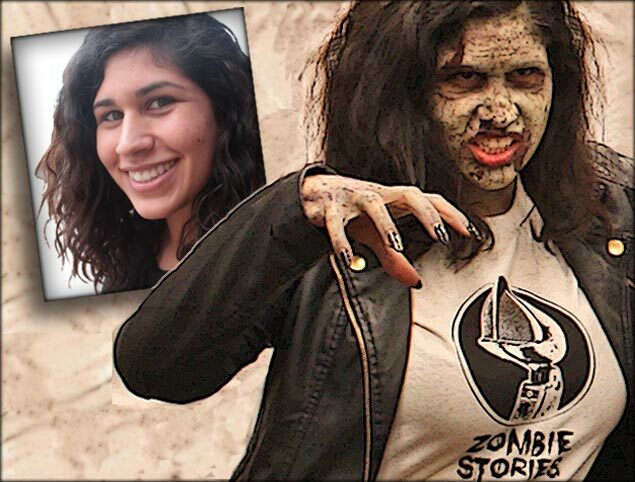 I turned into a zombie for the sake of journalism, and it wasn’t my first time. 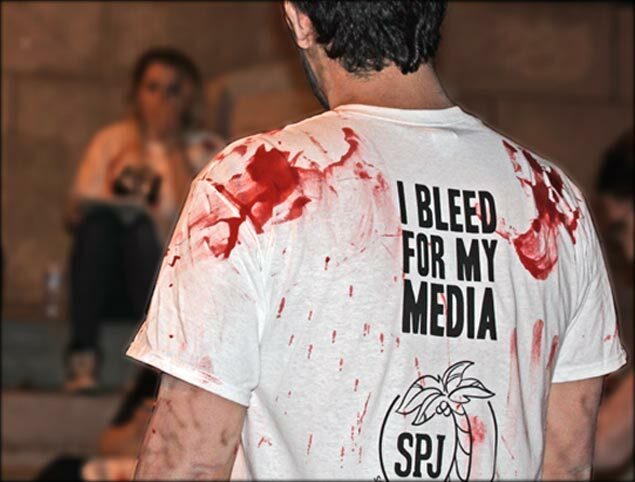 This is the second year I participate in Zombie Stories, an event organized by SPJ Region 3. It’s a workshop to die for, if you want to be punny. So Gorehound Productions’ Lucas Godfrey painted me an unhealthy looking green and splattered some fake blood on my face to make me interview-ready. This year’s Zombie Stories took place in a familiar setting to anyone who watches AMC’s The Walking Dead. …or, at least, that’s what Bryce McNeil, assistant director for student media at Georgia State University, told us (because I’ve never actually watched the show). Zombie Stories took place in an alley next to the Sidebar, and I did my best to stay in character by growling and getting uncomfortably close to the students who came to interview me. If a student asked me a question resembling the boring cliché “what’s it like to be a zombie,” we poured fake blood on their T-shirts. At the end of the event, nearly everyone had some traces of blood. But after a three-day journalism convention, these students were very quipped with their questions. I was impressed, to say the least. Q. What influences your decision into what horde to join? A. The freshness of their style, or the freshness of those they kill. Q. Which body part do you go for first when you corner your victims? A. The neck. My wife was a little fast, but I got her. A. The females will kill the males and vomit into their skulls, to procreate. We can reproduce in a couple of hours. Q. How long can you go before eating flesh again? A. Usually can go for a couple of days on a brain. Q. Which presidential candidate would you rather eat? Who do you think would taste best? On our way back to our hotels I flipped the switch and interviewed some of the winners – like Kayla Ebner from Rhode Island. She said she wanted to get political because that’s what seems to be on everyone’s mind, especially with elections around the corner. “I really wanted to bring in the election because it’s big right now, it’s a relevant thing, and I wanted to put a funny spin on it because we’re interviewing zombies, and that’s not a regular thing,” Ebner said. Zoe Debo was asking some hardball questions, focusing on getting information necessary to understand more about zombies. 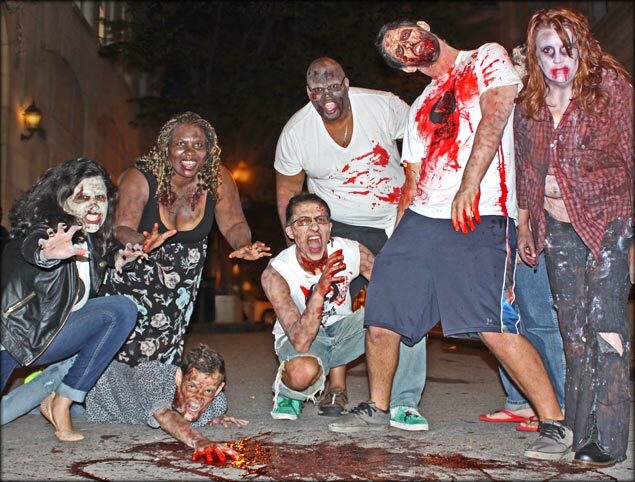 Some of the other zombies had plans to hangout with the journalists after Zombie Stories. I’d like to think the stories we shared painted a better pictures of zombies in general. That even the ghouls that arise in late October have a story to share, and if done correctly, can amount to better relationships overall. This entry was posted by Michael Koretzky on Saturday, November 5th, 2016 at 12:38 pm	and is filed under ZOMBIES. You can follow any responses to this entry through the RSS 2.0 feed. You can skip to the end and leave a response. Pinging is currently not allowed.